Sea Watchs' special cooking process ensures that their tender North Atlantic Sea Clams retain natual color, freshness, flavor and nutritional value. 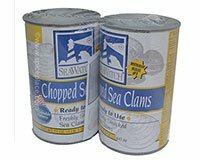 Sea Watch International chopped clams are delicious in dips, chowders, stews, stuffing, fritters, and pasta sauces. Ingredients: Sea Clams and Sea Clam Juice, Salt, Sodium Tripolyphosphate, Calcium Disodium Edta. Gazpacho with Clams More Recipes..